File My Divorce in the City/County Where I Got Married: The law firm gets calls every week from people living all over the country who think they need to come to the Columbus/Phenix City area to get a divorce even though they haven’t lived here in years. While every state has laws addressing where you can file a divorce, they all typically boil down to one question: Where are you and your spouse currently living? It has NOTHING to do with where you were married unless that also happens to be where you currently live. Annulments: This is another popular idea at consultations that is legally inaccurate. An annulment is a legal device for nullifying a marriage that was illegal, to begin with. If your spouse was married to someone else or was too young to consent to marry when he/she married you, then those are examples of situations where an annulment is appropriate. If you have been legally married for as little as a day, you need a divorce to dissolve the marriage. Filing For Divorce Will Make You Look Bad: Judges simply do not make those kinds of value judgments. If you need to file for a divorce, then you should file when YOU are ready. Over half of marriages end in divorce, there is no reason to feel bad about choosing what is best for your family. 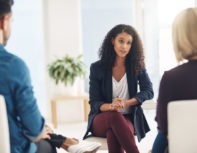 Counseling Before We Can File For Divorce: Although this may be a very good idea, neither Georgia nor Alabama require clients to attend counseling before they can file for divorce. Other jurisdictions may have different rules, but in Georgia and Alabama, you do not need someone else’s permission or approval to file for divorce. Spouse is Missing: If you have truly lost contact with your spouse, and you genuinely have no idea where your spouse is, then you may be able to get a divorce by publication. However, if you can contact a family member, friend, employer, etc. and get an address for your spouse, then publication is not appropriate. In this age of social media, texting, Skype, etc., there are many ways to make contact with a separated spouse. You will likely have a hard time convincing a judge that you and your spouse can chit-chat on Facebook, but you don’t know how to serve him or her with a divorce. If nothing else, ask them how you can get legal papers to them. If they refuse to provide their contact info, print off or screenshot the exchange, and that might help convince a judge to allow service by publication. Also, bear in mind that you can’t be awarded monetary relief from a divorce by publication. This means no child support or alimony can be awarded based on service by publication. So, the value of this type of divorce is very limited. In the weeks and months ahead, this blog will continue to explore subjects concerning divorce, child custody, child support and other family law issues facing our clients and our prospective clients. Contact us to learn more and know your legal options in a divorce.